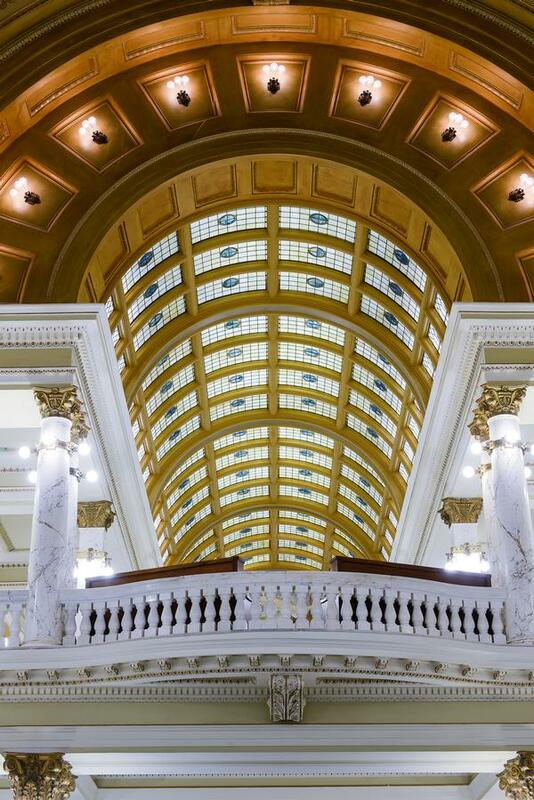 On November 2nd, 2014, the South Dakota State Capital celebrated the state’s 125th anniversary and the completion of a monumental stained glass restoration project. 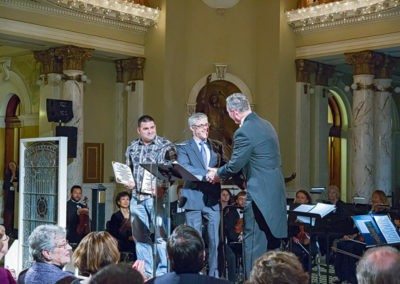 The event featured a performance by the South Dakota Symphony Orchestra and addresses from Governor Dennis Daugaard and State Supreme Court Justice, David Gilbertson. 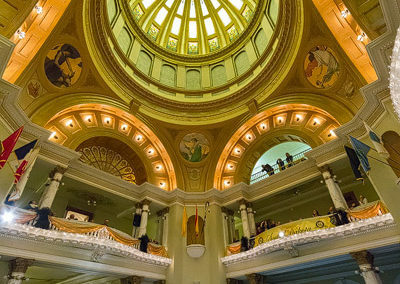 The year-long conservation project included stained glass from the rotunda dome, the barrel-vaulted ceiling above the grand staircase, and the skylights in the House and Senate chambers Overall, the Studio restored 4,400 square feet of glass. Each panel was carefully documented before being removed and transported to CSS, where the deteriorating lead was removed and the glass was cleaned. 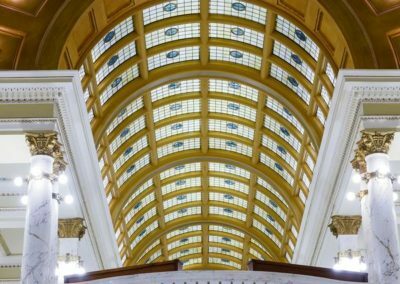 Irreparably damaged glass pieces were replaced with antique glass of the appropriate color and texture, and then every panel was releaded and reassambled. 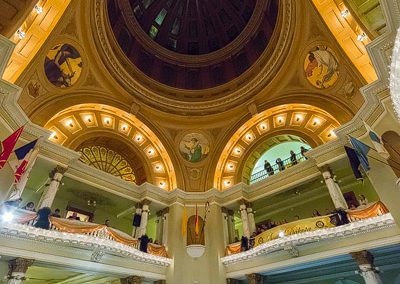 In recognition of the state’s 125th anniversary, the Studio presented Gov. 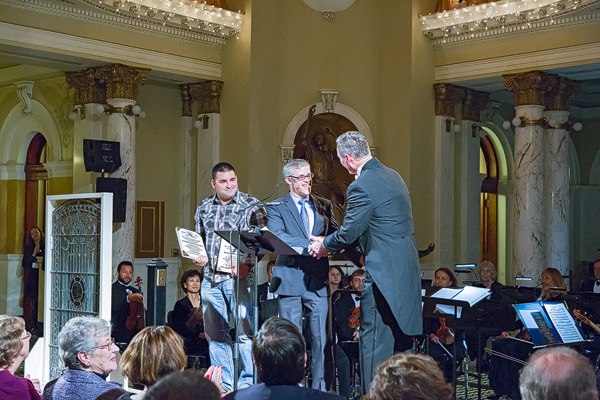 Daugaard with a decorative stained glass window for the Governor’s residence. 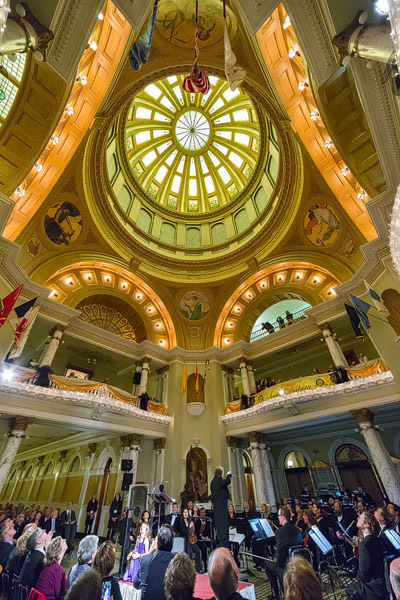 The window features 66 blue diamonds, which represent the counties of South Dakota, the state seal, and a laurel wreath with 32 leaves – the number of governors that have lead the state. 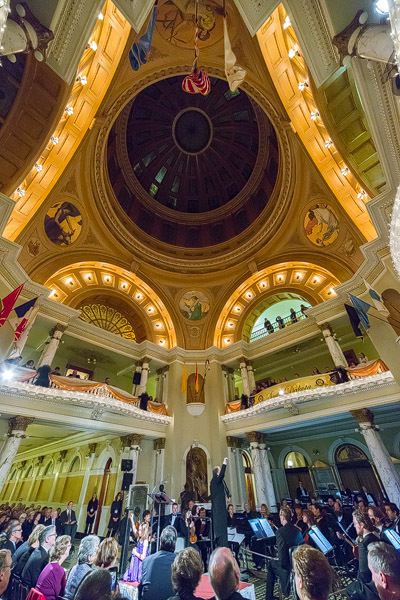 Conrad Schmitt Studios is priveleged to have been a part of this celebration and to be a part of South Dakota’s next 125 years.